Java-Gaming.org > Games Center > Contests > Are you going to participate in the Java4K 2009 competition? Are you going to participate in the Java4K 2009 competition? It will start Dec 1st and span Dec and Jan.
Re: Are you going to participate in the Java4K 2009 competition? I have a broken wrist, so it depends on how well it heals! But I'll definitely try for it if I feel up to it Nothing like a healthy competition. You know I want to. It's always an issue of time, though. And I'm claiming the name "Left4kDead"
I wonder what can be achieved in 4k of JavaFX script? That's a really interesting question indeed! Yeah, you bet! Retro Remakes ends on Dec 6th, though, so I'll be busy until the 7th. 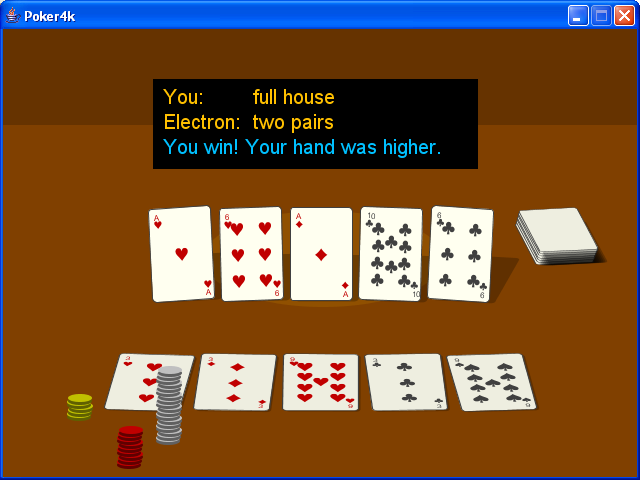 A very long time ago (a few years actually) I just about submitted Poker4K, as it wasn't quite playable, really. So, long time no siege with you guys. I'm ready for some competition! Yes. Already have one entry ready. Have my entry ready too! Just (another) little car game. Markus: I hate you! I'd already gotten started on working with ideas for "Left 4 Kay". On a side note, I'm working on a 4k version of mine and Laundon's Polybombs project, but I've not gotten very far - I might not finish it. It's a gravity battler with destructible terrain - think liero. Really? Because I'm working on a poker game as well... still don't know if it'll fit into 4k, but I'm debugging now. So yeah, if it fits into 4K, it will definitely be submitted. And if I can think of anything else to implement (and if I can get it done), I'll submit those too. Definitely much better graphics than mine will have, but there's sufficient difference no one could mistake the two. PS are there resources linking to the best ways to compress your game? Someone should make Portals clone this year. Would make great 4k game. No way for anyone to know when you coded your game. Submission period is from Dec-Jan. You can theoretically code your game any time. Yes I was thinking about the 2D flash game. Should be doable in 4k. Don't worry about your experience. Just participate. It is fun and you will learn a lot. Someone linked to the 4K help site that gives you suggestions on how to start. I have thought about doing a portal clone for 4k... however it will be very difficult to get level designs and the game engine in under 4k. I have made a tool in previous competitions to output the smallest jar from different obsfucators and zip programs. Ah, I remember that one. It's beautiful! A 2D Portal-like game was one of my ideas, if no one else tries it, I might.